Wow -- last night was ladies night and did we ever have FUN! It was wonderful to have so many of our friends and customers in the shop helping us celebrate with wine, great food and fabulous shopping. I would love to post photos here, but we were way to busy to take any! I do have photos of our "bouquet of the day" arrangements that we gave away all week, along with the names of the lucky winners. We will be drawing later today (Sat. Nov. 8th) for our grand prize of a year of flowers. Come on down before 4pm if you haven't signed up yet! Tuesday's bouquet was a textural feast for the eyes! 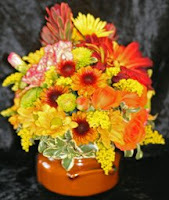 Tana designed this bouquet of fall flowers including rover mums, oncidium orchids, wheat and dracena foliage. 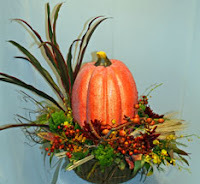 She also included permanent berries, grasses and leaves around a microbeaded permanent pumpkin. The recycled paper container is a great "green" option and is made right here in Oregon! Pat Yancey was the winner of this bouquet. Wednesday's bouquet was a classic combination of red roses and cymbidium orchids designed by Michelle. Details such as red-twig dogwood, dracaena foliage and aralia leaves provide the lines for this design. The design is based with red roses that bring out the red in the throats of the orchid blooms and pale green carnations that provide a splash of light to separate the leaves. Brock Smith, from California, was in Prineville visiting relatives and won this bouquet. Quite a gift to leave as a thank you! 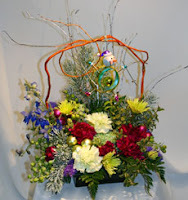 Thursday's bouquet was a fun frolic in the snow designed by Carol. Carol's fun designs featuring keepsake items are always customer favorites. This design showcases a fun jingle bell snowman ornament in "mid-jump" with his skis. Carol echoed the jewel tones of the snowman with lime green athos poms, blue belladonna delphinium and purple carnations. Glittery, frosted evergreens and berries finish this merry and bright Christmas bouquet, which was won by Diane Kenny. Friday's bouquet was a beautiful fall arrangement in purples and greens by Lyn. An ornamental kale is showcased in the center of this design. Lyn then repeated the various colors in the kale with the purple liatris, pink heather and chartreuse bells of ireland. The hot pink gerbera daisies provide a punch of color at the base. Proof that "fall colors" don't have to be orange and brown! Barbara Coffelt was the winner of this design. Congratulations to all the daily bouquet winners. We'll soon be posting the winner of our year of flowers drawing as well! As previously posted, we are giving away an arrangement every day during our week-long holiday open house. Our designers look forward to this week, because they are told "knock yourself out!"... we let them create whatever they desire to delight one of our lucky customers. Monday's arrangement was created by Gena. Gena loves structures in design and often builds armatures and other architectural elements for her designs. She saw a version of this at a design show and instantly decided to create something similar for the open house. The lucky customer who received this creation is Jo Hoppe, a teacher at Ochoco Elementary. It is so fitting that Jo's name was drawn, as she LOVES flowers and often drops by the shop to purchase flowers for herself to enjoy. 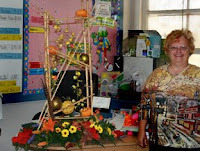 Now Mrs. Hoppe and her 3rd grade students at Ochoco Elementary will be enjoying Gena's design! Will you be next? Christmas is coming early to downtown Prineville! We are joining together with other downtown merchants to host our holiday open house sale! Starting Monday, November 3rd we will have our trees trimmed and our halls decked... and we'll be ready to help you with yours. We will have 20% off everything in the store for the whole week. We'll also be giving away an arrangement every day. You just have to come in and sign up! Together with Riches & Rags, Tasz Fun Living and The Quilt Shack, we will also host a "Ladies Night" event on Friday November 7th. All stores will be open until 8 pm, everything will be at least 20% off storewide and we will have drinks and refreshments. Come on down and join the party! Be sure to also sign up for our grand prize drawing, a year of flowers! We will draw for our grand prize on Saturday afternoon. You don't have to be present to win, but you do have to stop by and sign up! Hope to see you soon at the best holiday party in town! Our new candle line -- Tyler! For a variety of reasons, we found ourselves this summer searching for a new scented candle line to bring in to the shop. While there is certainly no shortage of great smelling candles out there, we were looking for something extra special. Happily, we found that in Tyler Candle Company! The Tyler candles are poured in heavy glass jars and have metal lids (with a great leopard print on them!) and are available in three sizes. We also carry adorable boxed votives. Many, but not all, of the fragrances are shown here in our candle hutch. The fragrances are more sophisticated, almost perfume-y, and are FABULOUS! With names like High Maintenance, Diva, Girly Girl, Cowboy and VIP how can you really go wrong? We currently have regular line and fall line scents in the store, with holiday (winter) scents coming soon. We have done several of our popular "candle with flowers" arrangements and I wanted to share a recent one we did ... fall flowers on the 11 oz. "pumpkin spice" candle. This unique gift sells for $39.95. So many of our customers have been delighted with them and tell us that this has already been their long-standing favorite candle. Sorry it took us so long to catch up with you! Stop by soon and let us share our favorite scents with you. We know you'll be glad you did! Are you "Tough Enough To Wear Pink?" It’s rodeo time in Prineville and some of the country’s toughest cowboys are headed into town. But come Saturday night, we’ll see how tough everyone really is when the Crooked River Roundup and Central Oregon Association of Realtors bring the “Tough Enough To Wear Pink” program back to raise funds and awareness for breast cancer. Here at the Posie Shoppe, we're joining in to extend the campaign all week long! We have pledged to donate 10% of our sales during rodeo week – Monday, June 23rd through Saturday, June 28th – to the Crooked River Roundup’s “Tough Enough To Wear Pink” program. In addition, we have designed a special "Tough Enough" bouquet featuring pink roses just for this week. We will donate $10 for every bouquet sold, which will be featured in the shop and on the website. Judy Holliday (co-owner of The Posie Shoppe) came up with the idea of the benefit week. We always try to support the rodeo and really celebrate rodeo week. But this year, we wanted to do something a little different. She was delivering a bouquet for a cancer benefit and suddenly remembered the “Tough Enough To Wear Pink” campaign. We knew that we could get involved in a new way, and hopefully raise awareness and funds for this great cause. According to Hank Simmons, President of the Crooked River Roundup Board, all the funds raised during the “Tough Enough To Wear Pink” campaign will stay in Prineville. The money will be donated to Pioneer Memorial Hospital to help fund breast exams for those who cannot afford them, along with helping with transportation costs to the breast cancer center in Bend. In addition, all the funds raised at the Crooked River Roundup will be matched by Wrangler in a donation to the American Cancer Society to fund research at the national level. “Tough Enough To Wear Pink” night will be Saturday, June 28th at the Crooked River Roundup. Everyone from participants to spectators are encouraged to show their support by wearing pink. Pink merchandise will be available for purchase at the Farmer's Market in downtown Prineville Saturday after the parade. Tough Enough To Wear Pink was created by entrepreneur and breast cancer survivor Terry Wheatley to bring the sport of professional rodeo and the entire western community together to rally against breast cancer. Since its inception in 2004, TETWP™ has empowered rodeos in the U.S. and Canada to focus attention on the need for a cure and raise over $2 million dollars for breast cancer charities, much of which stays right in the community. The grassroots movement has inspired other sports communities to mount their own TETWP™ campaigns, spreading a message of hope and support that reaches beyond the rodeo arena to competitors, families and fans across America. For more information on how to help, visit www.toughenoughtowearpink.com. We hope you will join us, get involved, send a bouquet and dress in Pink this Saturday! The holidays are behind us, and spring is still months away. Where's a great excuse to get all dressed up when you need one? If you're a high school student, you're in luck... Winter Formal is here! While it's not as exciting as seeing the kids all dressed up, we thought you'd enjoy seeing a few of our favorite corsages from this year's collection. 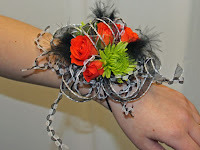 This corsage was made for Lacey Corak, who is completing her senior project with us. She was wearing a cream and gold brocade gown with a vintage hollywood feel. Cream satin ribbon was accented by gold braid, taupe sheer and pearl circlets. Miniature whire roses and cymbidium orchids were accented with brown fern curls. 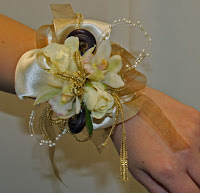 The person who ordered this corsage asked for "something really fun to go with a black dress". Now that gives us a lot of creative freedom... everything goes with black! We decided on a bright combination of orange spray roses and green mini spider mums. These were accented with black feather puffs, silver bullion wire and braided black and white ribbon. We love having the chance to custom design little pieces of floral art to complement beautiful dresses and striking suits. It's so fun to see the new styles and colors for the dresses. Black is always popular, but this year saw it's share of teal blue, polka dots and bright color too! For the young men, pinstriped zoot suits came roaring back. A black and teal dress inspired this cymbidium orchid corsage. Teal gems sparkled on the orchid petals, while the color was echoed in the ribbon below. 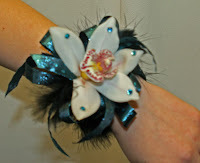 The corsage attached to the wrist on a feathered snap bracelet, giving an elegant yet fun look. Brown was popular again this year. 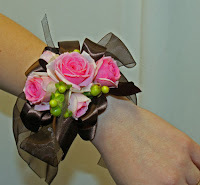 Pink and brown is a wonderful combination and it really shows in this fresh feeling corsage. Mimi Eden spray roses are a favorite of ours because they open and hold like tiny peonies. The coloring is out of this world, with a dark pink center fading through blush to white outer petals. Lime green hypericum berries provide a punch of contrast. The roses and berries swim in a sea of sheer and satin chocolate ribbon. We pride ourselves in the fact that no two corsages and boutonnieres are alike. We would love to show more. If any student would like to share their winter formal photos, please bring them into the shop. We would love to post them on the blog! Our new wedding site is finished! After being "under construction" for many months, our new wedding and event website is finally complete. We have included many features that we hope will be useful to you, including a downloadable copy of our brochure, a very cool wedding flower cost calculator and a form to start the free consultation process. We also have portfolios of our own designs as well as designs showcased at floral industry shows we have attended and photos from the book "Wedding Style". We hope that our free wedding classifieds section will provide a place for former brides to sell items used at their weddings, and brides-to-be to find inexpensive items to complete their events. No professionals here, just brides helping brides! Lastly, we have slideshows of real Central Oregon weddings that we have been involved with. Weddings held in Prineville, Redmond and Bend are shown with photos provided by brides and their photographers. Take a look, test drive the tools and let us know what you think!